Principal District and Sessions Judge R.J. Satish Singh has set a target for the police to register cases through a drive. 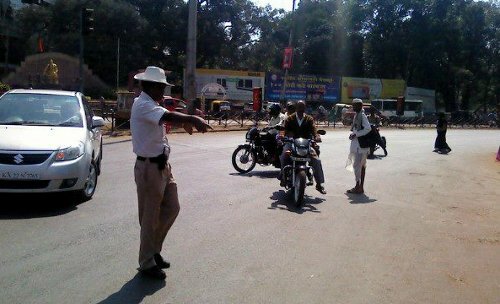 Taking serious note of growing incidences of accidents and glaring violations of helmet and other traffic rules in Belagavi and other cities and towns in the district he has asked the police department to look into all the violations very seriously. The Police Department had been advised and given a target of registering at least 22,000 cases of violations of helmet rule and other traffic rules. Mr.Singh would also discuss the issue of poor vehicle parking system in the city with the Commissioners of Belagavi City Corporation and Belagavi Urban Development Authority soon. With regards to the auto fare, judge indicated that he would convene a meeting of senior officials of the Regional Transport Office and the Police Department on enforcement of meter-based fare for autorickshaws. With the executive sleeping. No choice but for the Judge to don the role of enforcement.